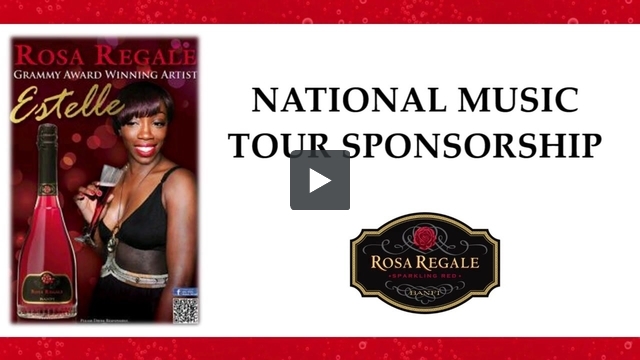 We created a multi-platform partnership with new-to-market sparkling wine Rosa Regale and R&B musician Estelle. After detailed brand analysis, importer Banfi Vitners discovered that Italian imported sweet sparkling red wine Rosa Regale was favored among the African American demographic. Additionally,the brand wanted to have unique content for social media repurposing as well as direct posting by third parties. Hollywood Branded provided consulting, and suggested partnering with a music artist relevant to the new demographic. The marketing team provided a budget to work with, and Hollywood Branded researched viable options and then successfully negotiated Rosa Regale’s integration into R&B musician Estelle’s music video “Thank You”. We knew that Estelle had past success with songs with Kanye West and was soon to be releasing her next single and album which would be well received by the African American community. After the debut of the music video, with the client now comfortable with a new marketing tactic, Hollywood Branded extended the partnership to include a multitude of additional partnership touch points with the artist, for which we provided full negotiations and activation. Rosa Regale received 7 seconds of logo exposure in the music video, including two close-up insert shots of the logo and wine bottle. The brand was so pleased with the exposure and the feedback that Estelle herself enjoyed the sparkling wine that we worked with them to grow the partnership with Estelle in increments: First sponsoring the artist’s pre-Grammy event which our team provided full build out and activation for, then sponsoring her US tour is select cities where Rosa Regale was to be sold with our team managing each city’s program, and then to a full-blown celebrity endorsement campaign including a print & POS retail/download campaign, accompanied by a private artist tour program. The program provided fan engagement, introduced the brand to a new demographic, and differentiated the brand at retail.